Mercedes came up with a brilliant idea and found an empty slot between the A 250 and the upcoming AMG A 45. 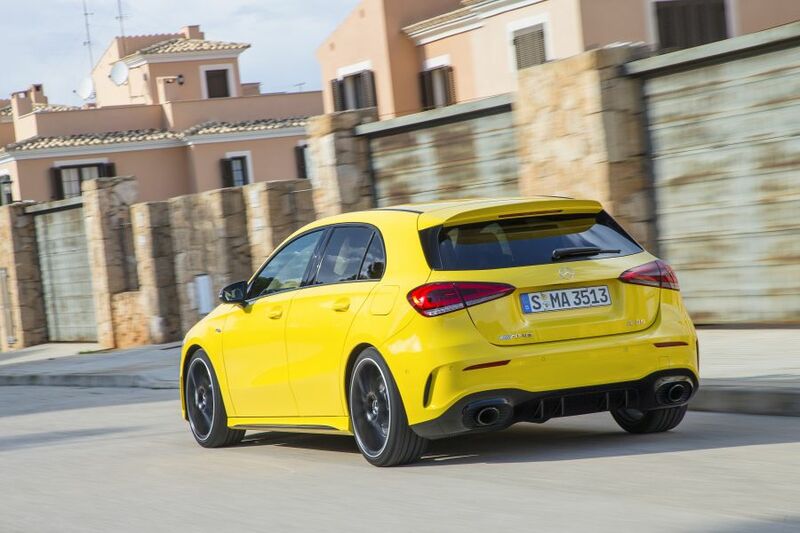 It is called the AMG A 35, features hot hatch performance and is way more exciting than the former AMG A 45 generation. I must admit the AMG A 45 never made me cry out “Wow”, as one would expect after driving a top hot hatch. It was a brutal model, with an obvious turbo lag due to a turbo with high inertia and it understeered quite strongly. It came for the price of approximately 60,000 Euros and accelerated from 0 to 100 km/h in 4.6 seconds, powered by the 360 horsepower (381 horsepower following the facelift). For this much money, the BMW M2 was the sportier and more exciting alternative. 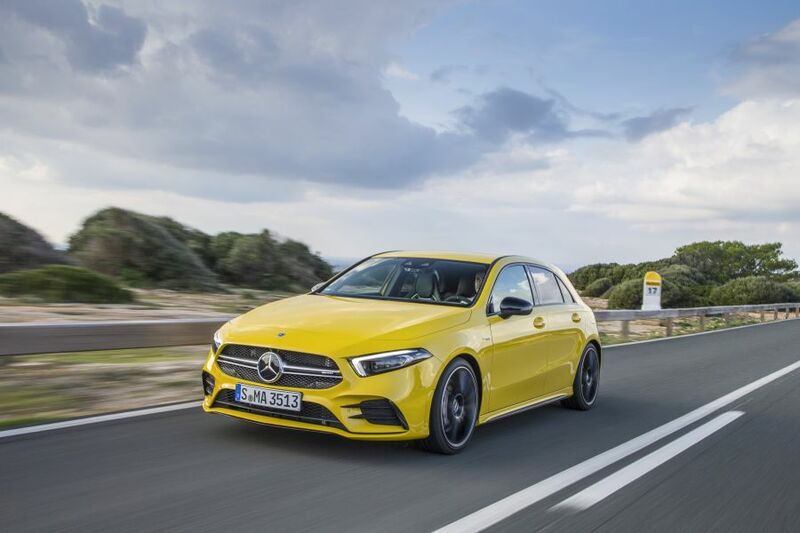 Mercedes responded fast though and, based on the new A-Class generation, that is based on the MFA2 platform, developed two hot hatches: the A 35, that I drove at the test drive in Mallorca and the A 45, that the company confirmed at the launch of the A 35. The turbo engine sheltered by the hood of the A 35 is a new structure, based on the M 260 turbo engine of the new A-Class. In order to prevent the turbo lag of the former A 45, Mercedes came up a brilliant solution. The case of the twin-scroll turbo features two pits and two exhaust routing, thus making possible the transmission of the exhaust gas separately to the turbo. 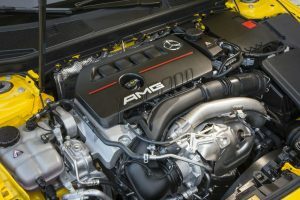 The four cylinders are divided into two groups, so that, even though there is a single turbo, the supercharging is carried out as if there were two, one per two cylinders. The turbo lag is thus very much reduced and the response of the engine is practically spontaneous thanks also to the Camtronic variable distribution. Hence the expectations were high from the technical perspective and the first test drive confirms the progress of the A 35 hot hatch. First of all, there are several adjustments for the drive train and we had to thoroughly read the press kit and request further clarifications from the Mercedes-Benz representatives. There are five programs for the drive train, because the Slippery mode additionally showed up next to the Comfort, Sport, Sport+ and Individual modes. The Individual mode allows the separate tuning of the engine response (Moderate, Sport, Dynamic), of the transmission (manual or automatic), of the AMG Ride Control suspension(Comfort, Sport, Sport+), but the AMG Dynamics comes extra. What does it do? It adjusts the ESP system and cuts in by slight breaking of the wheel inside the corner, reducing understeering. The Basic setting, integrated in the Slippery, Comfort and Advanced modes, can also be selected, activated in the Sport and Sport Plus modes, but they also allow manual actuation. We set off in the Comfort mode, without calling on the Race Start function, which is standard equipment. Opening a parenthesis, the A 35 accelerates from a standstill to 100 km/h in only 4.7 seconds, just 0.1 seconds slower than the first A 45. The power is instantly sensed as we go beyond 2,500 rpm and, at 3,000 rpm, the peak torque of 400 Nm is already available. In the Manual mode, the gears shift smoothly via the paddles behind the steering wheel. The engine features a decent soundtrack, and, similar to the A-Class, we note the obviously improved insulation. In the Comfort mode, the A 35 runs gently and comfortably for a hot hatch shod with 19-inch alloy wheels and small slip tires, thus being way more pleasant for daily use than the former A 45, especially since you also get more space and better visibility. But the rigid attachment of the rear 4-arm multilink axle somewhat impacts comfort on a road with potholes, but the A 35 stays among the most comfortable current hot hatches. We wish to see the other side of it and we press Sport. We smoothly downshift and the concert starts. Each downshift is accompanied, in this mode, by the exhaust rumbles. It makes quite a concert that delights hearing and there is nothing artificial going through the speakers of the car, as the A 35 benefits from a flap control like the AMG GT, that open and shorten the exhaust route in the Sport and Sport+ modes. We select sports car specific settings with the engine set in Dynamic mode, the gear box set in Manual mode (there is an anti-over raving protection), the suspension in the Sport mode and the AMG Dynamics in the Advanced mode. The first feeling is that the A 35 slightly understeers. The weight distribution is more balanced, the 4Matic all-wheel drive system allows electromechanical torque variation from 100% to the front to 50/50% and the McPherson front axle comes with an interesting innovation, as the lower arm is located underneath the wheel rod. All of these only reduce understeering and the A 35 is light-years away from the former A 45 in terms of driving excitement. The steering is extremely spontaneous and sharp and contributes to the maximum driving pleasure. The 2-liter engine vigorously pushes forward and feature a great linearity for a turbo engine supercharged at quite a high pressure. There is a real show onboard as well, because the graphics are different from the standard A-Class. There are thus three display modes for the instrument cluster – Classic, Sport and Supersport – that can be modified at any time via the touch buttons from the left side of the steering wheel, while the ones on the right control activate the MBUX infotainment system. The A 35 optionally comes with the AMG Track Pace, that displays the map and the sectors of a certain race track and records 80 different parameters of the lap. I will break your heart, but no, you can’t activate the AMG Track Pace unless you are on the race track, because the system is connected to the navigation and knows exactly whether you are on the race track or not. If you are planning on hitting the race track, you can tick the box of the AMG Aerodynamics Package, that comes with a modified front bumper and a fixed prominent tail wing, scoring points in terms of artistic impression. The AMG Performance seats with built-in headrests provide a quite good lateral support and they can optionally be wrapped in Nappa leather, Nappa leather/ Dinamica microfiber or Dinamica microfiber. Two-tone upholstery can also be ordered optionally, red/black for example, as well as the dashboard covered in artificial leather. Last, but not least, we must point out that the A 35 marks one more premiere. It is the first AMG beneath the 50,000-Euro price tag, opening the door to a whole new category of customers for the Mercedes-AMG division. 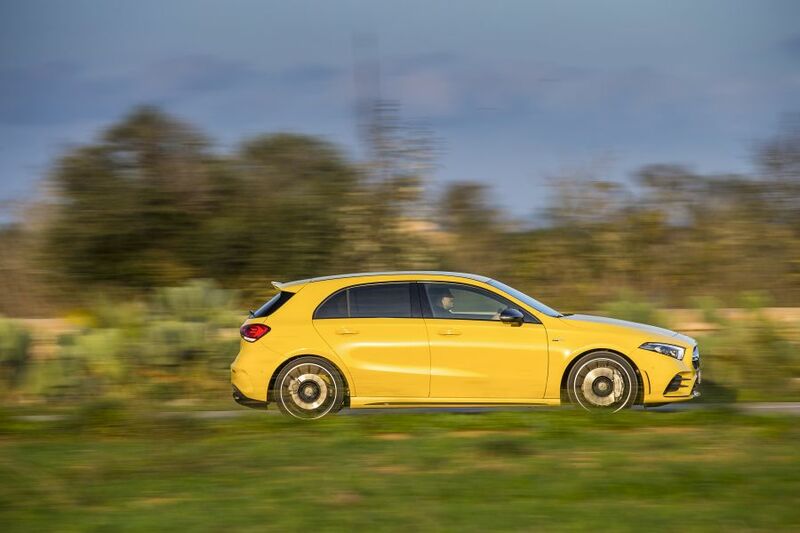 A Mercedes-AMG under the 50,000-Euro price tag, that is as fast as the first A 45, sounds like quite a tempting offer. And it is also more exciting to drive as it understeers less and the engine delivers a more spontaneous response.